I just finished this chair for the kids. It was an old rocking chair, I couldn't even guess the age. It could be from the 70's or it could be older. It was hideous but it had a great rocker underneath that allowed the chair to be stationary but rock on springs underneath. I wanted it to match our bonus room which I'm in the process of redoing for our new classroom. How awesome is this chair going to be to encourage my little ones to "read", with a red basket of books next to it, it will at least be tempting. Here's the scary before picture and read how I made the changes. I cut off that poor bears head. Yes, my 4 year old was very concerned about the bear having its head cut off. I'm sure I'll get to hear about it FOREVER! I painted the exposed wood red, which was a very dirty beige before and simple covered the seat first, then the back and unfortunately, I did have to use my hot glue gun in places. However, I now have the beauty you see above. When shopping thrift stores, look at the "bones" of the pieces you are buying. If they are frail or weak, don't buy. It'll probably be a waste of time and money. If the structure is good and sound and just needs a little TLC...BUY! You can fix it! YES YOU CAN! Definitely a huge improvement! Great work! I love this!!! I have some project in the works too but i am sure they wont end up looking that good. 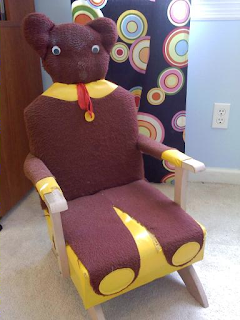 That bear chair was an antique, and worth a pretty penny. 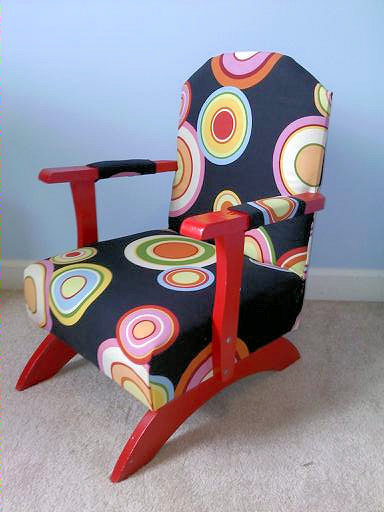 Do you know the brand of this chair? I am looking for one for my little one.